The Muslim holy month of Ramadan begins at sunset on May 15 this year, which is the start of the ninth month of the Islamic lunar calendar. It marks the beginning of religious observances wherein many Muslims all over the world fast from sunrise to sunset. But while fasting is a major part of Islam, it’s not all that Ramadan is about. Muslims use fasting as a way to abstain from worldly pleasures and pray to become closer to God, or Allah. Not only that, Ramadan is a time for families to bond and spend time together while taking part in cultural traditions. 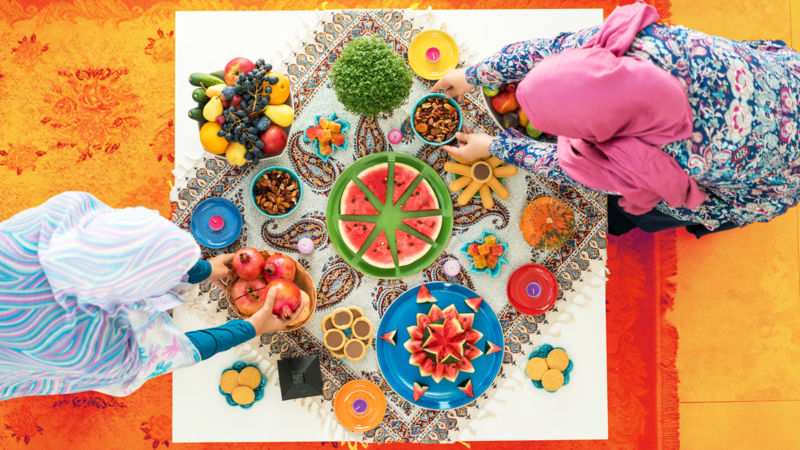 Here’s what to teach kids about the Ramadan holiday — and how the whole family can celebrate together. Ramadan is a time for “sacrifice and renunciation as well as a period of reflection and spiritual growth,” says Florian Pohl, associate professor of religion at Oxford College of Emory University, in Live Science. The way Ramadan is celebrated varies from country to country, culture to culture. Many families wake up together in the middle of the night, before the sun rises, to eat a hearty meal that will sustain them until sunset. Others stay up together till the wee hours of the night to eat and then and have a short sleep before getting up to start the day. Depending on where they are in the United States, many Muslims will end up fasting for around 17 hours — a considerable feat to keep up for 30 or 31 consecutive days. A fast isn’t just about not eating or drinking, though; it’s about keeping your head clear of negative thoughts and actively participating in acts of kindness and charity. Once the sun sets, families and friends gather to break the fast, which is typically done with dates, a nutrient-rich treat. Mosques often hold iftar celebrations and welcome non-Muslim members of the community — as well as the less fortunate — to join. At home, iftar is usually a casual meal, but one filled with delicious fare. Depending on the cultural traditions, you may see things like potato samosas, hearty beef curries, honey-drenched desserts and plenty of juices and water to help rehydrate the body. Ramadan culminates in Eid al-Fitr, a three-day celebration in which families and friends gather, visit with their loved ones and enjoy more delicious meals together. Charity is a major aspect of both Ramadan and Eid al-Fitr. It’s customary to make a donation to the poor or disadvantaged during this time. Children generally don’t begin fasting until they reach adolescence, but there are many other ways to involve them in Ramadan celebrations. Many Muslim families with young children begin by decorating the house with balloons, streamers and flags. Some even hang lights up outside, akin to Christmas season. The idea, of course, is to create a festive atmosphere and get kids excited about the special month. Many families read Ramadan-focused storybooks at bedtime to teach kids about the holy month, and others spend a few hours making “Ramadan kareem” (which roughly translates to “may Ramadan be generous to you”) cards for their family and neighbors. Many families involve their kids in their charitable endeavors. Some bring used or new toys to local shelters, while others bring sweets and drinks to local mosques to hand out to at-risk children during iftar. Other families collect money to donate to their favorite charities. Some parents create games or charts that encourage their kids to focus on daily acts of kindness. These can be big or small — the idea is just to do a thoughtful deed for someone else without expecting anything in return. Another great way to get the kids involved each day during Ramadan is to get them to help prepare the iftar meal. Depending on the ages of the children, they can do small things like set the table, put the dates on each person’s plate, fill the glasses with water and help chop the fruit and veggies. If you’re not familiar with Ramadan, you may be nervous about how to interact with your friends that are fasting. CNN Travel provides a great etiquette guide for both Muslims and non-Muslims: Don’t worry about eating in front of someone who is fasting. They will understand that you aren’t fasting, and you’re free to carry on with business as usual. If you’re invited to an iftar, try to wait to eat until everyone’s fast is broken after sunset just as a courtesy. After that, feel free to dig in; iftar is a big communal meal that is meant to be shared with friends. When it comes time for Eid al-Fitr at the end of Ramadan, you may be invited to an Eid party or two. It’s not much different than a party you might attend during Christmas season; there will be lots of loud family and friends, and tables will be buckling with the weight of the food. If you’d like to bring something to celebrate with your friends or neighbors, dates or any kind of sweets are a welcome gift. Others love freshly cut flowers. Try to stay away from bringing a bottle of wine, though, as many Muslims don’t consume alcohol. “Eid mubarak,” which means blessed celebration, is the typical greeting you’ll hear during this time. While Ramadan is a time for inner reflection, it also brings families and friends closer together. Whether it’s getting up early to eat a meal at the kitchen table before sunrise or joining friends to break the fast after sunset, Muslims all over the world look forward to this holy month each year.